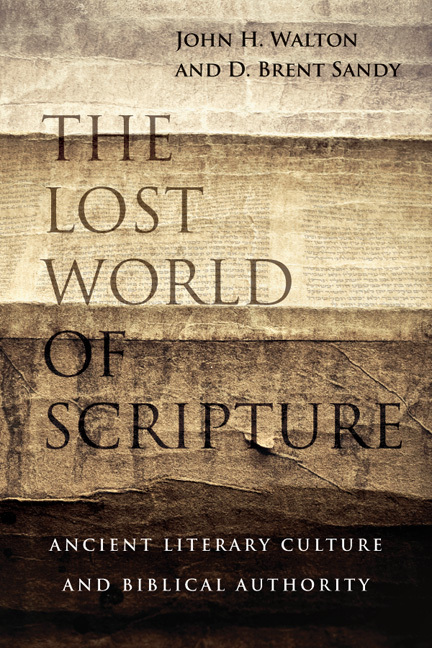 As I read the last section of The Lost World of Scripture by John Walton and D. Brent Sandy it became apparent that there was more than one post worth of material here for us to chew on. John and Brent begin by listing some safe and some unsafe conclusions concerning Scripture and biblical authority. Here “safe” means within the bounds of Christian orthodoxy and a high view of Scripture as an authoritative revelation of God. They are not presenting a finalized set of principles for biblical interpretation but a set of ideas for consideration, discussion, research and reflection. These are talking points for the church. It is safe … The following is a summary of the discussion by John and Brent although I have reordered some of their conclusions. It is safe to believe in the verbal inspiration of Scripture. John and Brent are committed to the authority and inerrancy of Scripture (although inerrancy is applied to the intended message as we will see) and affirm the verbal, plenary (i.e. unqualified, absolute) inspiration of Scripture. Even variant wordings, event orders, and emphases can be inspired to convey the intended message. We don’t need to harmonize to protect Scripture from error. God spoke words, not simply ideas. … Faith communities validated the words received and it is those words that we affirm as inspired. It is safe to believe that the way God communicated to humans is more complex than we have been accustomed to think. It is safe to believe that the Old Testament and New Testament were located firmly in the cognitive environment of the ancient world. It is safe to believe that God revealed truth orally. (“written forms were inspired because oral texts were authoritative and because written texts reliably represented the truths stated in oral texts.” (pp. 294-295)) Written forms are not inherently superior (although they do preserve somewhat better). It is safe to believe that God empowered faithful followers to pass along oral texts of divine truth. It is safe to believe that God often works through processes that we would label “natural,” and that therefore when a “natural” explanation can be offered God is not thereby excluded. It is safe to believe that the Holy Spirit superintended the process of preserving divine truth. It is safe to believe that once divine revelation was inscribed in writing, written versions did not supersede oral versions. It is safe to believe that the authority behind a book is more important than identifying someone as the sole or direct author. For example, Moses could be the authority figure in Exodus, Leviticus, Numbers, Deuteronomy without being the direct author of the books as we have them. It is not essential to affirm that Isaiah wrote the entire book of his name. Communities were generally involved. It is safe to believe that the existence of an autograph is not always realistic or necessary. It is safe to believe that some later material could be added and later editors could have a role in the compositional history of a canonical book. It is safe to believe that the inspiration of written texts of the New Testament is an inference based on the inspiration of the Old Testament. This is an interesting one for John and Brent to add. I expect that they are considering the fact that there is no internal or external affirmation of inspiration for the New Testament. But the authority attributed to the Old Testament by Jesus and the Apostles is reasonably extended to include the canon of the New Testament as affirmed by the church through the work of the Holy Spirit. It is safe to believe that conventions for reporting events in the Bible differ from our contemporary conventions of history writing. It is safe to believe that the Bible can use numbers rhetorically within the range of conventions of the ancient world. It is safe to believe that Old Testament prophecy and New Testament identification of fulfillment do not need to align. Both are inspired. This one could use a great deal more discussion. But it isn’t a line to draw in the sand. So what isn’t safe according to John and Brent? There are a number of key points here, most responding to assertions put forth by skeptics and skeptical scholars about the nature of the Bible. It is not safe to believe that the Bible is just like any other book. The Bible uses language, forms, and conventions of the ancient world because this is how effective communication works. The unique status is inherent in the message about God revealed in the text (God’s self-revelation to his people). It is not safe to believe that the Old Testament is derivative mythology combed from the ancient world. It is not safe to believe that everything we find in the Bible can be explained in natural terms. It is not safe to believe that people and events portrayed in narrative about the real past are fictional or literary constructs. The narrative history of Abraham, Joseph, Moses, Ruth, Samuel, David, Solomon, Jeroboam, and so forth … clearly identify real people in a real past. Of course we must be careful here … if Jonah or Job for example were not intended to convey the narrative history of real events or people, then we should not force them into this mold. “Our decisions must be driven by our best assessment of what the biblical narrator intended.” (p. 304) I am convinced that the genre of Job and Jonah is not narrative history … but that is a topic for another post or two. It is not safe to believe that biblical books have used pseudepigraphy, forgery, or false attribution. We have copies of many ancient books (e.g. Enoch) that purport to be written by some famous person. John and Brent affirm that this does not happen in the canonical books of the Bible. However, they also warn that we should consider the ancient context. Writings from a school of prophets following Isaiah could be contained in the book of Isaiah without jeopardizing the authority of the text. The statements above are in direct response to skeptical claims concerning the nature of Scripture. These skeptical claims are not consistent with the authority and inspiration of Scripture. The last point John and Brent make (actually in the middle of their list – I’ve taken it for last) is directed toward the expectation of faithful Christian readers of Scripture. It is not safe to believe that inerrancy is falsified by the orality of Scripture. Certain versions of inerrancy are falsified by a careful reading of Scripture itself. But this should redirect our thinking. “The alternative is to recognize that inerrancy needs to be redefined in light of the literary culture of the Bible.” (p. 303) Personally, I think we are better off using other words to frame the authority of Scripture in a positive form rather than redefining inerrancy. Scripture is truthful and reliably preserves and conveys the nature, message, and mission of God. It carries the authority of God. It is counterproductive to the faith to try to squeeze Scripture to fit a mold of our own making. What do you think of this set of statements concerning our approach to Scripture? You may also comment on Faithful Conclusions at Jesus Creed. Guess I read this will Enns in mind. 1) In this set they seem to implicitly deny or at least shy away from human involvement in the creation of scripture. A looong time ago, I read some arguments that Paul believed he was inspired (e.g. 1 Cor 7.40). Peter likewise defends the apostles (incl. himself) and his message likening himself with prophets who wrote scripture (1 Pet 1.16-21) suggesting that they too are being ‘carried along by the Holy Spirit’ (v21).